Day One of the 30 Day Shred is over, and I KNOW I can do this (repeat this five times fast). I just can’t tell you how much I dreaded this day, but I finally got it over. Not only can I do this, but you can to! Jillian breaks down each task into really short intervals, so if you feel those muscles getting rubbery (which you will), just keep pushing through because it will only be two more minutes and then she moves you onto something else. There were times when my legs, stomach and arms were SO shaky I almost stopped a little shaky but with the kids all watching, this momma was NOT going to give up. Now when my 13 year old started giving us his advice from the kitchen table while eating his chips and salsa…I had a few choice words. 😉 Literally, there may be times within the first five minutes that you tell yourself you can’t do it. My bootie was even hurting and I don’t even think she worked out that muscle, but this ladies is where we take control back of our exercise life. We CAN do anything for 20 minutes, so don’t let that mental head whisper tell you differently. If you need to modify what she is demonstrating, then go for it, but just keep moving. Do not stop! Our two daughters started the Shred with me and within five minutes, my seven year old said, “I HATE this DVD,” and proceeded to sit on the coach and twirl her hair. My 11 year old made it all the way through and I am so proud of her. This is not about being skinny or looking good (although I’d be fibbing if this isn’t a fantastic benefit that I desire). This is about healthy living not only for myself, but also for my daughters. (Our boys are so physically fit, they put me to shame.) I want to model balance to them in multiple areas – physically, mentally, emotionally etc and it begins in the home, with me encouraging wise choices in eating and exercise. A few tips from my first day. Wear good shoes. There’s going to be impact and even because I was working on the carpet I thought I would be fine with bare feet. NO! Make sure you wear some solid support. Keep water and a towel (for sweat) close by. Keep those fluids going. One of my goals this month is to drink one gallon of water a day. I know drinking water is KEY, yet I never quite get there. I am going to keep a cold pitcher in the fridge and make sure I drink it by the end of the day. For hand weights, I used two jars of salsa. Just go with what you have. They were nearly 3 pounds a piece, and I will be working my way up with the amount of weights that I use, but I know I can’t conquer the 5 lb weights we own. Check out Play it Again Sports for second hand weights, if you’d like to invest in some. Take pictures and measurements. (UGH, I know) I actually had my boys LAUGHING out loud at my muffin top. You can bet I am not posting those pics until after I lose it, but you really do want to be able to measure the difference. For me, it’s not so much about weight loss as it is feeling better and losing the flab that I have gained. Just say “NO” to your inner self when it says to take a little rest. Just say “Yes” to the jello feeling legs that will barely get you up the stairs to the shower, knowing that the pain and soreness just gets you one step closer to our goal. Did you make it through? How was it? Just 29 more days to go. Don’t forget to follow my Balancing Beauty and Bedlam Facebook Page where I update throughout the day. Here are the posts that led to this 30 Day Shred. Good for you!! And it is great that your kids are witnessing their mama doing something healthy for herself. I am so excited to see you starting this. I started 30 day Shred 7 days ago. It is great to be accountable to someone else! When Jillian says something like by day 6 you’ll feel that its easier I didn’t believe her but today I made it through with only one “mini” break (I truly HATE the jump rope part!!). Ok, I did it! I haven’t *officially* committed (as in, I haven’t announced it on my blog yet, lol) but I’m ready to kick this baby weight! Question…are you doing this EVERY day for 30 days? 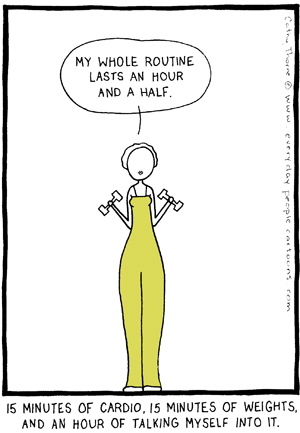 I know there are some days (Sunday in particular) that I normally break from working out. I think the strength circuits are the hardest. Abs are a huge relief after those strength circuits! Pushups! Booo! I’m late getting started – just ordered a copy and will start the day it arrives – want to look in shape for Thanksgiving! What “size” hand weights do I need? Thanks! I did it yesterday! Haven’t done today’s yet… planning to right after the kids go to bed. I started 30DS once before and got bored with doing the same workout every day. If anyone else has that problem, I’d suggest mixing it up by not doing 10 days of stage 1, 10 days of stage 2, and 10 days of stage 3. You can always do the easier versions of the exercises, but I’m preferring to mix them up this time. Variety! OK..I am in too…why? B/c when I told my neighbor about the “challenge” she told me she bought it months ago and I could use it for free for 30 days to see if I liked it! Woo Hoo! My question: Did I miss Jillian’s instruction or fast forward too fast??? Do we pick one level a day and do just that? We don’t do all 3 levels in one day right? I did level 1 today and yes, I totally needed a sweat towel too. I used 5 pound weights. I did it once my kids went to school so no comments by the crowd. ha! @Kathy, HA – smart to do it with no peanut gallery. 🙂 No, you definitely don’t do all three levels at once. Start with the level one for ten days or the first week, then move up to level three and so on. My friend recommended after you get the hang of how to do it , then turn the sound off and listen to your own music. I thought that was a great idea, but now I definitely need her telling me what to do. I need to buy the DVD still! Although I’m concerned about the high impact. Would it still work if I didn’t do the high impact? Day 1 complete….Yay me!!! Tough first day workout, but I know it will get better. I have MS, so I had to slightly modify the jumping jacks and jump rope exercises. Who know, maybe I won’t have to modify them by the end of the week! It’s only 20 minutes, you can definitely fit it into your day. Good luck all, and keep with it!!! I really can’t stand Jillian or the backgrond music so I rock out to my iPod, which helps the time go by faster too. And I have a love/hate opinion of you right now, Jen! Love ya for the encouragement and accountability, but hate ya for making me do this again! Ok…I’m in! I had a baby 12 weeks ago, and I am still holding on to 15 extra pounds. Would love to see those go away. My husband is home sick from work today and sat in the recliner and teased me while I did the work out! I told him he better stop laughing because he will be joining me tomorrow! I had my baby 19 years ago, and I’m still holding on to 15 extra pounds! So I applaud you for taking the time in the midst of your busy life as a new mom and doing this for yourself. Hang in there! I wish I could use the new baby excuse, but my baby is seven. 🙂 But no matter what the age, yes, it’s a busy life. I thought about joining you in this, but there is nowhere in our small house to do this without everyone watching, and “chiming in”. I think I would dread that more than the exercise. I’m going to take to the road for a walking program and see if I can’t build up to “power walking.” I would consider this if I could do it without an audience. well, if it makes you feel any better, there isn’t a lot of bouncing around, but yes, they will still see you sweat and struggle. I’ve been doing the DVD for a few months now. I mix it up by doing different levels 3 days a week. In the beginning I just did level 1 until I felt “strong” there. It does get easier as you get stronger–not that it is “easy.” I still use 2 pound weights because she does so much shoulder work that I find difficult. My goal is to move up to 3 pound weights after Christmas. I’ve asked for a set for Christmas. My husband, a big fitness guy, has done the workouts with me a few times. He was surprised at how much he was sweating and the fact that he got a great workout. Don’t let anyone fool you. This is an excellent exercise program that will give you results if you make the commitment to exercise regularly and eat a healthy diet. Great job with Day 1 Ladies!!! I’ve ordered the dvd from Netflix, should ship out today. I am hoping I can do this, I’m gonna tell myself I CAN do this. I’m always trying to lose 10lbs but then put it right back on again after a couple of months. It’s the exercising I hate doing and can’t get motivated to do. Hopefully with your help and others commenting here, I can stay on track. I have a ‘healthy blog’ I think I will post to every day to keep myself accountable too. Are you eating a healthy diet’ while working out, or can you still eat ‘normal’? I’m also on track w/my eating today which is my hugest challenge. I can exercise, but I have been having NO self control with eating. Thanks for making a venue to make us accountable and know we aren’t alone in our struggle and journey. Ok… you have totally inspired me! I bought this last summer on clearance at Walmart for like $4. I did it twice I think. I’m on board! 🙂 Hate Jillian, but love me anyhow! Congratulations on completing day ONE. I’m proud of you. I am on day 3 … but I’m using Walk it Out for Wii (which your girls would probably love). Good job, Jen! I’m not doing this particular excerise, I’m doing T-Tapp, and worked out this morning. I’m trying to do it before we start school each morning. That’s cool that your daughters are doing it with you, sometimes my daughter who is 10 does it with me and sometimes not. I’d love for you to address in your series how to have the balance of getting into shape to be healthy without putting off a negative image to our daughters. I worry about that with my daughter as I see and hear so many teens and preteens very dissatisfied with their bodies and many times it’s just the shape God has given them and it doesn’t matter how “skinny” they get, they will still have the same shape. There’s alot of comparing, etc. My daughter is not there yet, but I want to be sensitive to how I go about losing weight so that it encourages her and not discourages her. When my girls were younger I showed them videos like this one … http://www.youtube.com/watch?v=iYhCn0jf46U&feature=related … to show how the models in magazines were edited. And we emphasized in our house that beauty starts on the inside and is expressed on the outside. Can’t wait to start…..I had my gallbladder out and will be cleared to start working out again Thursday…so I will be a few days behind, but ready to start! Yeah! I am down 47 pounds since Memorial Day….my secret is only not eating everything in sight and walking! We have 7 weeks till family pictures and I can’t wait! Thanks for the added motivation! Yeah! YAY for all you shredders!!!! No shred for me, but today I walked for 25 minutes, then did serious lunges (50) up my driveway hill. Yay for us! I did Level 1 day 1 tonight! Didn’t get it done until 7 tonight, but better late than never!! I used 5 lb weights except for the front shoulder raises that kill me, I only used 3 lbs for them. Hope I can stick with this!! Jen, I just love reading your blog! This is my first time to comment, but MUST comment about the Shred. It does what it says it will do – your body will change (for the better!). I have taken a few months off from shredding and, thanks to your challenge, started back today. And it was every bit as horrible today as it was the first time I shredded, but you’re done in 20 minutes! So thank you for this challenge! I so needed it! This will be my 3rd time starting the 30 Day Shred! I did it faithfully several months ago, 6 days a week; I took Sundays off. However, I ate anything I wanted, whenever I wanted, so I didn’t lost much weight. I could tell my muscles were starting to tone up. This time, I’m eating a low glycemic diet, so, I hope to see weight come off and lots more definition in my muscles. If you are a regular exerciser, it is good to mix up the levels throughout the week, but if you feel you need to work up to levels 2 nad 3 (which are definitely harder), then stick with level 1 for 10 days. Progress to level 2 for 10 days, then go to level 3. My favorite thing about this DVD is that the workouts are only 20-25 minutes! I did it! I did it! !……..I could barely hold my arms up to wash my hair in the shower afterwards…….but this evening, I’m actually looking forward to tomorrows work out!! Thanks for doing this Jen! Man, I really want to join in… but last time tried out ole Jillian, I couldn’t say enough cuss words at her! Seriously. I just could NOT do it… I was so embarassed at myself I just quit! I know, boooo quitters! Kudos to you for not only doing this but doing this with an audience of your children… the audience of myself was bad enough! Good Luck! I hope someone can answer this for me. How much floor space do you need to do 30 Day Shred? My house is tiny and I don’t want to waste money if I don’t have the space to do it. Thanks. @Bethany, Bethany – I’ve only done level one but you don’t need much space at all with that level. You could seriously do it in a 2 foot area since we stay in one spot. Can’t speak to the next levels, but am assuming it’s very similar. I finished Day One, level One today!! Had to take a break midway through, as the electricity got knocked out for about an hour from a bad storm. I started over and finished it though! My arms are still tingling! I just finished… I think I was almost falling asleep during the bicycle crunches… once my head hit the floor, I felt tired all of a sudden :). Today was day 5 for me. I started on Thursday of last week so I could have the weekend to recuperate. We can do this ladies!! OK, OK, OK. Had this on my wish list, then took it off because I didn’t want to buy one more dvd, work out for a week, and then quit AGAIN. Then stumbled onto this post (not even sure how I got here – the Frog I think. Bought the dvd earlier this evening and starting tomorrow. 30 days? I hope so – if nothing else than to stoke a new habit. No chasing the world, just tending to the temple, ya know? My Jillian DVD has been gathering dust for almost a year. You’ve inspired me to dust it off and start up. I’m with you! Day 1 is done…. legs shaking, very sweaty. Thanks for getting me motivated! Ok, I went and bought the dvd and some 2 pound weights from walmart tonight. I am going to start Wed. (the 15th) that way my 30 days is easier to keep track of. ANd what a great example you are for your kiddo’s! Last summer my sister and I would go out in our cabin at my parent’s farm and do the SHRED together! I don’t think I could do it around anyone else! I DO NOT see HOW you did it in front of your kids just watching you. When I do it at home I make my hub SWEAR he will not walk into the workout studio! I’m having to FOCUS completely…and if he walks in….I will lose it! I sure wish it didn’t make my knees hurt! It really is a GREAT workout! At times I have felt like a 90 year old woman doing the SHRED….like holding onto my treadmill to pull myself the heck up off the floor! And I’m in pretty good shape! Looking forward to following your 30 day journey! And I have to say! I am so mad at myself! I let the day get away without a WORKOUT! I LOVE THE 30 day shred! And guess what, I started it yesterday TOO! I was doing it awhile back, and LOVED IT! I LOVE that it is only 20 minutes! So doable! And I see results when I do it! @jan, the DVD works great in a laptop. Plus, you can take it into the remotest location you can find, so no one can watch you! Right, Jen? The best thing about using the laptop is that you can pause the DVD when you’re done, & just minimize the screen until the next day, then bring it back up & back up to the beginning. @Elaine Pool, Nope, doesn’t work for me in the laptop. Wonder if it’s the Vista software that’s got me messed up? Says it can’t read the disc (same as the Wii) … very odd. Oh well. @jan, hmmm, very strange – I was using my son’s laptop to play it this summer, & his runs Vista. Were you running it in Windows Media Player, rather than RealPlayer? That’s what player his ran it in. You inspired me and I started yesterday. I got the DVD earlier this year and have done the workout on and off. I am committed and can’t wait to see the results. I am so sore but will press on! Thanks for the inspiration! I love your blog! Goodbye muffin top! I completed Day 1 on Friday and still haven’t done Day 2. I guess I need to do Day 1 again. I plan to get it in before going to work this evening. I was concerned with the jumping and noise I would make for the neighbors below me but when I got home this morning from a meeting and I could hear every word of their music the worries were over. I guess it was just another excuse for me. I completed day 1 yesterday and have been putting off day 2 so I can get some important things done around the house BEFORE my muscles hurt too much to finish them. I had trouble typing yesterday afternoon because of my shaky arms! LOL I’m so glad to be joining others as I get back into shape. It’s been too long and I want some of my pre-kid strength and endurance back! I did day 1 this morning before everyone woke up. I told my oldest…if you get up early stay in your room..LOL!! Today was my Day 1. Jillian can’t kill us, right? That was the most brutal workout I have ever done, that may be embarrassing to admit, but there you have it. On the rare occasion that I do exercise, I use Leslie Sansone Walking DVDs. She is so nice. So calm. Did I mention nice? She does not make me feel shredded :). I am going to try this. By the way, what is it with our 13 year old sons and the chips?! As I am typing this, mine is reading and eating chips…at least he was mowing while I was working out :). Love those boys! And my eight year old daughter did it with me while my other two sons watched. My son with Down syndrome, upon seeing me panting and laying on the couch when it was all over kept asking if I was okay :). I smiled (fake) and said I was just fine! Sorry for the loooonnngg comment. Thanks for the accountability…we will see if I stick with Jillian or go back to super nice Leslie :). I just found you on Twitter. I did Day 1 yesterday too! It’s my 3rd time starting the Shred though so I knew what to expect! I have never fully finished 30 days so I’m excited to!